Once again New Bridge at Gunnislake was closed due to an accident so it meant a long detour for our friends in Devon to reach Cotehele Quay for our weekly walk. However, a few made it and with the usual half a dozen away on their monthly walk, only twenty signed in this week at the exact same time that a short, sharp downpour of hail rained down on us so the register very quickly became a sodden sheet of paper! Well, March ‘came in like a lion’ with one storm after another, but as the saying goes it ‘went out like a lamb’. Whatever the weather for the rest of 2019, science has shown that placing one foot in front of the other leads to some serious health benefits which include improving the memory and halting the deterioration of brain tissue as we age. But why would anyone choose to walk on a treadmill whilst staring at the same spot in from of them when when they could be outdoors amid the ever-changing scenery? 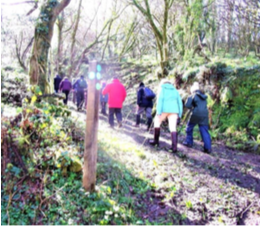 Our friendly Tamar Valley Walk & Talk group has gone from strength to strength since it was first established in 2009 due amongst other factors to the wide variety of walks on offer. Instead of listening to music on a headset in a sweaty gym, we have birdsong and the fragrant, earthy smells of the countryside to revel in whilst listening to the opinions and taking part in the conversations and of men and women from all walks of life. 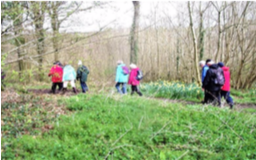 Cotehele estate is always a popular destination due to its many footpaths which over the years have become familiar to the majority of us however; there are still one or two walkers for whom each path we tread is a new experience. 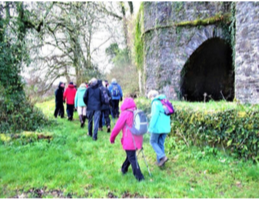 Soon we had been led past the first of the lime kilns and then The Edgcumbe tea rooms but I wonder how many were aware that the building began life as a lime-burner’s cottage before becoming a pub by 1840’s and then more recently a licenced restaurant and tea rooms. Cotehele has several sets of lime kilns still in good condition, all remnants from the past such as this fine set at Dung Quay on the far side of the Morden Stream. was probably once a cart track used for transporting goods down to the quayside from up at Bohetherick and St Dominic. When everyone had recovered from the steep off-road climb we followed Maggie along the edge of the field, through a gate and along the track that comes out in the hamlet of Bohetherick where some of us noticed ‘Trig House’ standing nearby, an odd name that dates to a time before motorised vehicles. ‘Trigging’ is a Cornish name for a method that is now obsolete but would once have been used to stop the rear wheels of horse-drawn carts from turning as the carts went down the steep hills similar to the one we had just walked up from Dung Quay. The iron trig shoes would have been lined up in front of the rear wheels at the top of the hill and the cart was then rolled into them before the heavily laden vehicles made their way downhill. 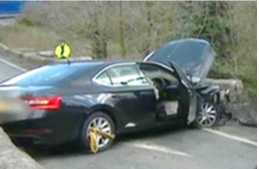 The trig shoe was attached to the end of a chain but when not in use it was hooked up on the side of the cart. This one is owned by one of the parish councillors and I was given permission to photograph it at a Farming & Market Gardening exhibition held in August 2018. Incidentally, those wagon trains that once crossed the American plains had a similar braking system which they named drag shoes or ruggles. From here we followed the road towards St Dominic but were soon turning right and back onto the St Dominica Trail which proved rather muddy but we are a seasoned bunch and just ploughed through it, hardly giving it a mention. 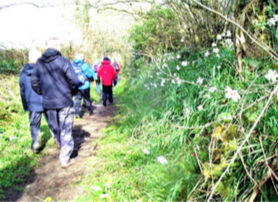 There were Primroses galore and some early Stitchwort flowers and Daffodils to admire as the path continued ahead and down a flight of wooden steps. We could see Cotehele Mill through the trees but instead of going that way as most of us expected, Maggie found us another hill to climb! 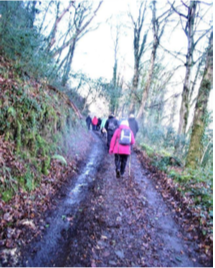 We did eventually reach the top and were pleased to find that the tarmacked road went downhill towards the Morden Valley where we were soon crossing Boar’s Bridge over the stream and back onto the Cotehele estate. When we arrived at New houses everyone recognised where we were as a recent walk had brought us to this spot from a different direction. It was all flat walking now passing first Cotehele Weir and then on past the bridge, the Shamrock, the DiscoveryCentre, the lime kilns and The Edgcumbe back to where our cars were waiting just as another sharp hailstorm rained down on us….. but it had been dry for the last two hours so no-one was complaining.